Flexible TPU Filament is an excellent material for 3D Printing. We’ll talk about the brands of TPU, slicer settings, show cool stuff we’ve made, and more. What is Flexible TPU Filament? While most 3D Printing filament is rigid, TPU is a more soft and flexible option. TPU stands for Thermoplastic Polyurethane. TPU is different from rubber in that it is melted then cooled while rubber is vulcanized. Thermoplastic Polyurethan can be re used by melting since it’s ultimately a thermoplastic. They are 100% recyclable. Rubber on the other hand can’t really be recycled. That’s why you’ll see companies trying to find uses for old tires such as shredding them and using the material in playgrounds as a replacement for sand. By the way, the video above was made by students in our Stop Motion for Kids and Teens class. There are many things you can do with a flexible filament like TPU that you couldn’t do with anything else. Most parts you print are rigid and can’t bend much before breaking. But by using a flexible 3D Printing filament like a TPU you can now make soft and pliable parts. Generally this is accomplished by printing the part thin. While a thin part made with ABS or PLA would just break, a 3D Printed part made with a flexible TPU will bend easily without breaking. You can also make very durable parts. By printing it with more perimeter layers and infill, you can have a part that is still pretty rigid yet won’t break if dropped or squeezed. There is just no way to list all the possible uses for flexible TPU filaments here. But we’ll cover some, including things we have done at Kinvert. We originally looked in to flexible TPU filaments for 3D Printing when students decided to make construction equipment for Maker Faire Detroit 2017. Since the students were making Construction Robots, we quickly decided to look for flexible filament for the treads/tracks, tires, and conveyor belts. 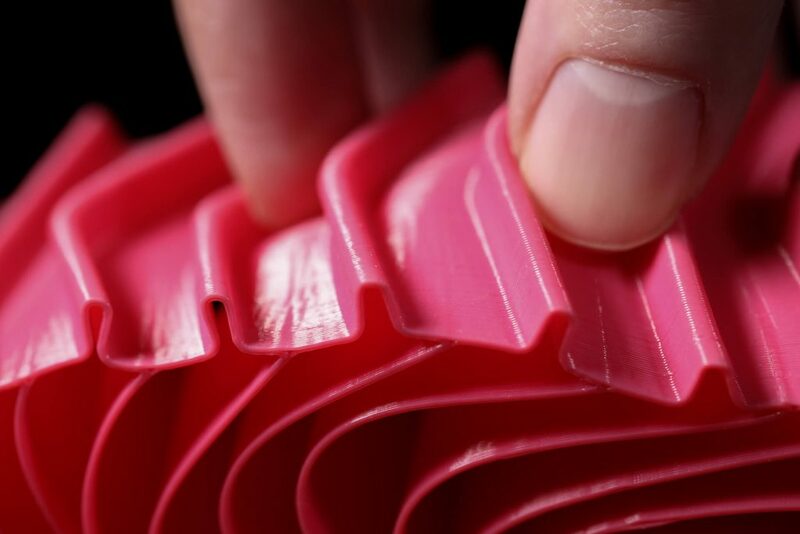 During our search we immediately came across Ninjatek’s Ninjaflex filament. We got some and started testing. Eventually we found that due to the weight of our robots, Ninjaflex was too soft and also a little too slow to print with. We have Ninjaflex in multiple colors. The images with pink parts are Ninjaflex. So we switch to Ninjatek’s Cheetah TPU filament. The images you see with black parts were printed with Cheetah. TPU is used in many fields outside of 3D Printing. When used outside of 3D Printing it is not used as a filament. 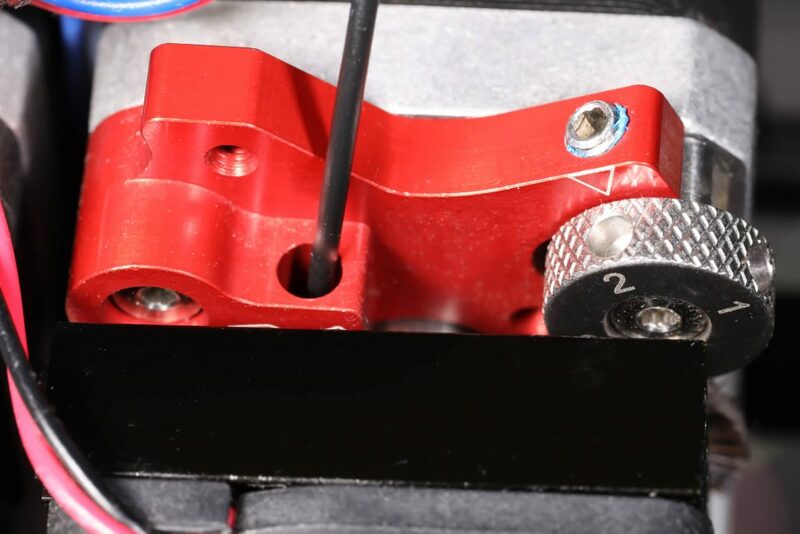 Some things they make with TPU includes phone cases, the soft insulating material around wires, drive belts, caster wheels, and many other things. From what I’ve read Adidas is also starting to use TPU in some of their shoes which is pretty cool. I’ve also read that Thermoplastic Polyurethane is used for those protective covers for keyboards. Flexible TPUs have some special properties that make them amazing for certain 3D Printing projects. One important property is the Hardness. In particular you tend to buy TPU filament measured in Shore Hardness. The softest TPU filament we currently know about is Ninjaflex at a Shore Hardness of 85A. Another important property, depending on your application, is the Elongation. 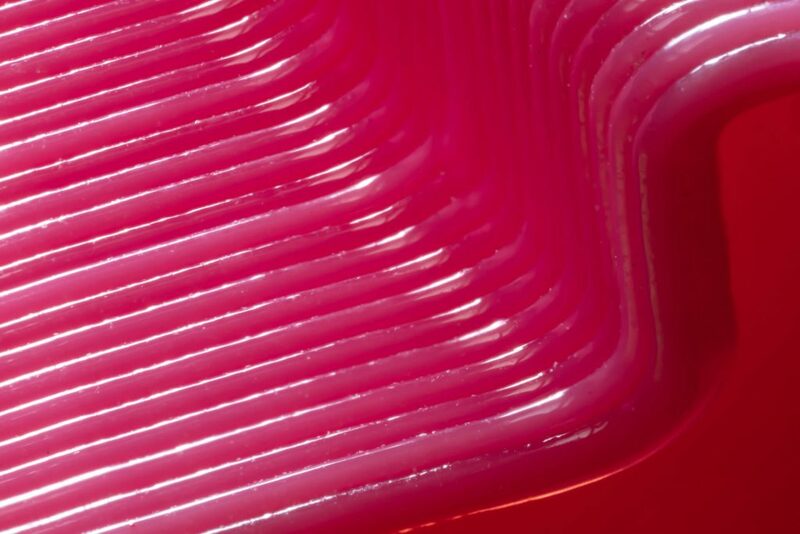 For Ninjaflex you can Elongate or stretch the material to 660% its original length before it will break. As with all 3D Printing filaments, another important property is the Melting Temperature. In the case of Ninjaflex it’s around 220C and up. I want to start this by saying I know the image above looks like candy, but don’t eat it. When printing with a TPU you will need to make several special considerations. Again with all 3D Printing filaments you need to make sure you can handle the Melting Temperature. Start at the documented Melting Temperature of the particular filament you got and be ready to tweak those values (not all nozzles are perfectly calibrated for temperature). Another important thing when printing with TPU is that you generally need to print much slower than with PLA or ABS. This is due to multiple reasons but one of the biggest is that extruding TPU is like pushing rope. If you print too quickly the TPU is likely to buckle and bend and it won’t want to go in to the nozzle smoothly. You will likely need to make modifications to your 3D Printer to be able to print with flexible TPU filaments. This is due to the extremely soft nature of the material. Again, you are trying to push a flexible material that will just want to bend and flex. So you need to make sure the TPU has nowhere to go between the Drive Gear in the extruder, and the nozzle itself. The best solution I’ve seen so far is to get a Flexion Extruder. We have one and it works great for TPU, though there are other extruders we prefer for ABS and PLA. Currently it seem the leader in TPU filaments is Ninjatek. You can find the Ninjaflex we used here – https://amzn.to/2BVNV8N to find the current price. If you want to help support us please consider buying through the Amazon link above. We’ll get a small percentage of the sale and you won’t pay a penny more. They make a few amazing materials, a couple of which we have used with great success. Kinvert has used Ninjaflex, which is incredibly soft and surprisingly easy to work with. Ultimately it is so soft that it wasn’t the best choice for our heavy construction robots. I don’t think there is a softer TPU filament on the market. Ninjaflex is absolutely incredible and you have to try a spool. We have also used Cheetah at Kinvert. It is a bit harder than Ninjaflex and prints much faster. This is what we used for the construction robot tires and treads/tracks. While it would have been possible to use more layers with Ninjaflex, we found it was much faster and more effective to use a single layer of Cheetah. This got us the same strength while cutting the print time by more than half. Amazon Basics makes TPU, as well as SainSmart. There is also a brand called YoYi. While there are many other brands making TPU, we don’t see many with great reviews. Please let us know in the comment section if there is a flexible TPU filament you have used which you recommend. We have lots of information on STEM topics such as 3D Printing, Robotics, Coding, etc. Let’s start with 3D Printing related articles. You should consider checking out 3D Printer Repair, What is ABS Plastic, What Does ABS Stand For, and 3D Printing for Kids and Teens. We also talk about great STEM products and gifts. Best STEM Gifts for Kids, Cozmo Vs Vector, What is Robotics. If Coding is your thing, we’ve got you covered with Block Coding, Age to Teach Kids Python, and Scratch 3.0 Vs 2.0.